The Saintly Sixteen continues with a matchup between two inspiring women, Anna Alexander and Edith Cavell. To get to this round, Anna got by Peter Claver while Edith surprised John Wesley. Yesterday, Maria Skobtsova advanced to the Elate Eight by trouncing Quiteria by what is likely a record margin, 91% to 9%. We’re too lazy to look back at all the previous matchups to figure out if this is an actual record margin, but knock yourself out and let us know. She’ll face the winner of Martin de Porres vs. Dymphna. “Hey, wait,” you’re thinking to yourself, “What happened to this week’s episode of Monday Madness?” Don’t worry, you’re not losing a step. Due to some technical difficulties based on being in exotic locales like outside-of-Cleveland, there was a glitch in the production process. Look for a better-late-than-never edition later today. “The Bar is Open!” is not a phrase uttered by Deaconess Anna Alexander, but it could be. Stories tells us that when the diocese would not build her a new church, she took over an abandoned whiskey bar and converted the bar to an altar to God. Come one, come all to the Bar of Christ! Maybe church membership would not be in decline if we decided to implement such creative practices in getting the job done as Deaconess Anna. But Deaconess Alexander’s zeal for her fellow brothers and sisters in Christ did not just begin or end at the Altar of God, she walked the talk right out into her community and kept walking by foot to spread the word of God to African American Georgians between the towns of Brunswick and Darian. That’s what I call a real ChristWalk (™)! The children she touched along the way went on to become teachers, nurses, and advocates in their own communities for the education and inclusion of black people in the south. Deaconess Alexander is the pebble that was dropped in the pond of Georgia that had ripples of impact that went on for generations. Recollections from her students account Deaconess Alexander as both mother and father to the children in Pennick, Georgia. No matter how bad her students acted, she responded with kindness and a firm assurance that learning to read and write would make a difference one day, even if her students did not realize it now. Students remember that Anna Alexander would not just ensure her students were well educated enough for college, she would drive them there if they did not have the means to do so. She was known for providing not just education, but clothes, food, and shelter to ensure the well being of her flock. While some saints were deeply devout to all things God and church from infancy, Edith was not one of these saints. She was a typical child of her era. An avid artist (several of her paintings survive) and active outdoorswoman, she found Sundays tedious, as her father kept a strict Sabbath – no reading from any book other than the Bible, no play, and certainly no card games. We glimpse Edith’s opinion of this Sunday routine in a letter to a cousin, where she says, “Do come and stay again soon, but not for a weekend. Father’s sermons are so long and dull.” Servants of the household also frequently discovered the Cavell children deeply involved in card games while their father made Sunday parish calls. Nevertheless, she persisted in her calling and career as a nurse. In the hours before her execution, her chaplain reports she said, “I have no fear nor shrinking; I have seen death so often that it is not strange or fearful to me.” She said goodbye to her priest, adding she would see him again in the presence of God. Edith was executed by a German firing squad on October 12, 1915. Her other memorials include Mount Edith Cavell in the Jasper National Park in Alberta, Canada, several movies, musicals, and masses and an opera composed in the late 1920’s, of which two of three acts have been found. 196 Comments to "Anna Alexander vs. Edith Cavell"
Me, too. These are my two “finalists.” All I can say is that I’m glad this is just a “game” & that I’ve learned about two women/saints that I’d never heard of before. Thank God for both of them. I agree! This was the hardest choice in all the years of doing this. I ended up going with Anna Alexander. As a teacher who deals with kids who do not seem to care, I have seen what happens when one educator won’t give up on them. I feel like she quietly changed so many lives! And she inspired me to be a better teacher! Part of the joy of Lent Madness has been learning about some of God’s people for the first time, and the other great joy is reading the thoughtful comments of the Lent Madness Community – And like Karen. I want them both to advance. Thank you for clarifying my dilemma. I want both of them to advance. Maybe the most difficult choice of ALL Lent madness matchups, ever. Even after a pause for morning prayers, still impossible! Good to remember they already share in all the company of heaven. In the end, I voted for Edith, for her holy “mediocrity” and persistent example to all extraordinary ordinary people. I as well. Also for her willingness to take care of others at ultimate cost to herself. Yes, this is a tough choice. Both deserve the Golden Halo. I absolutely agree so I just quickly shut my eyes and kept trying to vote until I managed to hit one of the names. I’ll never say which one. Agreed. This is the first time I returned to the original writings on each, and still couldn’t really decide. I voted for Anna Alexander because I’ve lived in Georgia for most of my life, but have never heard of her. The quote, “Edith has plenty of capacity for her work when she chooses to exert herself” was the kiss of death for me. I cannot vote for someone who is only occassionally into it. My father used to say about me that I did good work although not much of it. That was his opinion, it was Edith’s teacher’s opinion. Opinion is not necessarily fact. Here here. In school I got the same evaluation. Of course that was well before anything was known about learning disabilities. As an adult I return to college, was tested and helped. It may have taken me 12 years to work, raise 3 kids, and go to school from no credit to Massters. But I did it, and with straight As. To this day I also credit spell check to help my dyslexic eyes. Good for you. My brother-in-law had educational support from the day her started school, thanks to his forward thinking mother. He even attended a very good college under an LD program. However, he still does not read well, but has learned to make the most of his gifts and is a very successful salesman. Following my mother-in-law’s example, we got our daughter diagnosed early, with NonVerbal Learning Disorder, and with lots and lots of support and focusing on long-term progress, she is now a senior in high school taking 5 AP classes, and has been accepted to a very prestigious college. She never learned phonics well, or to spell well, but she is an amazing sight-reader. Interesting that didn’t bother me at all. It just sounded like an officious boss who wants things done the way she wants them done and she hadn’t found her calling yet. Once she did it sounds like no one would call her lazy or not a hard worker. As a person who has often fallen short of others expectations to be someone I am not I completely related to this part of her. It was inspiring to see the amazing person she became once she found her niche. And yet, there must be something about her. Last round she won soundly and there has likely not been another person more devoted to his work than the opponent she beat. Work with a world-wide impact a hundred-fold greater than her own. Sometimes, a simple example and a martyrdom carry a lot of weight. I think you’re right about the advantage martyrdom gives. I myself am not tempted to be martyred, even if it gave me an edge in some future Lent Madness bracket. I hope to see a contemplative win one day and look forward to Julian of Norwich returning to the madness; someday she’ll get that golden halo. I have read books on Edith Cavell’s life & works and totally disagree with her teacher’s comment! She went on to open a School of Nursing in Belgium where she taught and nurtured Nursing students. During WWI she sheltered and hid British and Belgium soldiers from the Germans. Her life ended in front of a German Firing squad for all her good work! This short note does not begin to tell all the good work she did in her short lifetime!!! That quote about Edith’s mediocrity nearly won her my vote! I’m kinda mediocre, if I’m honest. And we who are mediocre need our heroes! But I voted for Anna because WOW, what an incredible woman. Nothing stopped her. I’ll admit, though, the wording about “the children she touched along the way…” made me imagine her walking between Brunswick and Darian and tapping kids as she passed them in the street, and due to her magic touch, they became “teachers, nurses, and advocates.” Of course it wasn’t that simple, but if anyone writes up her official hagiography, you can have that one. I’m so glad I’m not the only one that read that with that image in her head. I figured I needed another cup of coffee after that one! I haven’t voted yet. I’m torn; this is a really difficult match-up. Seriously? She died for doing the right thing. I’m pretty sure she exerted herself when it counted. OK, but remember that was when she was a student. Many students that I encountered, as a high school teacher, did not “hit their stride(s)” until they entered the “real” world. However, I still haven’t decide which to vote for. I may decide to sit this one out (which I NEVER do in “real” elections), just because I can’t vote for BOTH of them. Those of you who were able to make a decision are to be commended. Um . . . Edith was executed for helping free hundreds of Allied POWs. You think she was “only occasionally into it”? Stood fearless before the firing squad, but some clown at some point early in her life said she was not always doing her best. Well, obviously the clown must be right — uh, right??? Lord help Saint Francis of Assisi if you ever wander into an area where they determine whether he ought to be a saint. I agree that this one is difficult–both left a wonderful legacy. I agree. I am extremely torn this morning. Both are inspiring women. Tough choice today. I voted for both of these amazing women in the first round. On the one hand, Edith who undoubtedly saved many people through her nursing and was martyred for not refusing to help anyone regardless of their side in the war. On the other hand, Anna who walked in love through many obstacles and made a profound difference that is probably still felt today in Georgia. In the end, I had to go with ” tough love, and enduring kindness, to soften the hardest hearts” so I voted for Anna. I agree with Ann’s comment above: this is such a difficult choice. I voted for my fellow American, and that’s the only reason! I love reading about these wonderful people. That was my rationale too! It’s true that the longer we go in Lent, the harder the choices are. Really, people. If you’re going to advocate for a proponent of education, you need to check your copy better – it should be an “abandonED” whiskey bar and it’s “altar” not “alter”. Despite these goofs, my vote goes to Anna! Must be technical difficulties due to the exotic location! By the time I read this morning’s post (almost 7:00 a.m., PDT), those goofs had been corrected. If only we who comment could edit our comments too. Autocorrect wrecked one of mine last week. I’m disappointed that this had been corrected before I had a chance to read it. As an English teacher, I should be glad it was fixed. However, as one always in need of grace, I love the idea of an ALTER to God. The greatest gift we can place on the altAR before God is our willingness to be converted from whatever we were (a bar, a sinner, a saint….) and be altered into the persons we were created to become. The video sealed it for me – thanks, Frank! This is a great video. Thanks for sharing it. Thank you, Frank. The video you produced about Anna’s father learning to read, using the Bible and the Book of Common Prayer, was inspiring too. This was the hardest choice yet, coming right after the easy one yesterday, but Anna speaks to my heart. She gets my vote. Such a wonderful message from Presiding Bishop about Deaconess Alexander. Thanks, Frank, for sharing it here. So many of the great women and men with whom I have taught over the years consider teaching their ministry. Most teachers I know and love go way beyond teaching the standards. Each goes the extra mile to meet individual needs of children. Whether it is a hug, a new pair of shoes, a listening ear, food for the weekend…every extra gift brings with it love and hope. My vote is for Anna. Well said Rebecca on the ministry of teaching. Like many of you, I struggled with this decision and ended up choosing Anna. I am inspire by her commitment to educating marginalized African-Americans in Reconstruction Era South. Plus, the song written by the kids at the Episcopal Day School in Augusta is darn cute! Fabulous! What a bright way to start the day! Tough choice, I agree. Both are extremely worthy and inspirational women. 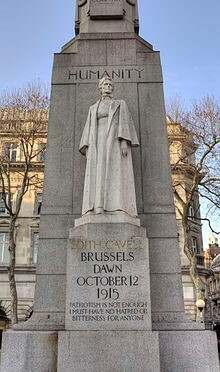 Had known of Edith Cavell before L.M. but not of Anna Alexander. Going for Deaconess Anna in this round in the hope she will become better known. One of the schools in the benefice I serve is named after Edith Cavell. She is a beloved and saintly woman whom the people here admire greatly. Truly tough choice today. I can relate to Edith is so many ways — the awful Sundays of enforced piety to the comments about her work efforts — go Edith. Speaking of bars… Edith Cavell’s is a pub just across from Norwich Cathedral. Well, that does it. I’ve got to go back to Norwich! Thank you. All is well indeed! Oh my gosh, Lynn!!! Hello!! Tough choice but went with Anna because she reached out to the African American community which was marginalized and with education helped the community. I had to vote for Anna, in tribute to the amazing Deacons I have known. But this does not in any way disparage Edith, who sounds like she would be equally deserving of the golden halo. Hope to see her in future Lent Madnesses!! What a hard choice to make today!! Ugh. I went with Edith probably because I read her second… i wish these two were meeting later. Episcopalian nuns do exist, they do exist, they do exist. Anna gets the vote today. Of course they do ! God bless them all ! Deconesses, unlike nuns, could be married, but like nuns prior to the decision of the General Convention of The Episcopal Church to allow women to be ordained as deacons, they were not ordained as they were not male. Once the diaconate was open to women, becomes a deaconess was no longer an option. Note by this time then-British Hong Kong had had female deacons since before WWII and had already priested three of them (Florence+ in 1944, and two more in the late 1960s). But yes, there are multiple orders of nuns and monks in the Anglican Communion, including here in the States. While all three ordained orders are open to both monks or nuns, as they are to lay men and women, I only know of one monastic, an SSJE monk whose name escapes me pre-coffee, who has served in the House of Bishops. This was a very hard choice; both embody women I try to emulate on a daily basis. I only voted for Edith because she paid for her beliefs with her life. I agree that this one is close. In death Edith has been remembered and memorialized. But although I am from Georgia I never heard of Anna Alexander of Pennick, GA before. I like voting for an obscure Deacon. She belongs to the History of Georgia and the Episcopal church. I find the focus in the Saintly Sixteen on pithy sayings and quirky quotes to diminish many of the saints and it helps to go back to the initial write-up from Round One. For example, today’s text on Edith makes her seem like a well-off slacker who didn’t use her gifts wisely. I’m sure many of us wouldn’t want to be examined today based solely on our high school report cards. Thanks for republishing those words, Deborah. I too went back and confirmed my sense that Edith’s biographer, probably unintentionally, had thrown her under the bus in this round. Thank you so much for reminding me about the facts in the first bio sketch about Edith. I would have appreciated birth and death dates for both candidates. It would have given me a historical frame of reference to make a more educated choice. Those should be in the biographies in the first round, the links to which are in the very first paragraph. Anna’s date and even time of death, appears in the photo of her statue up above her quirks & quotes section. I voted for Edith because when I was growing up we went to my maternal grandparents’ house every Sunday and after dinner the adults played bridge in the dining room and the children played Rook in the living room. Every Sunday my grandmother said “If the preacher comes put the cards away.” I never understood as a child why she said this since the preacher never came to visit on Sunday, never ever. Brought back found memories. Oh, this was a hard choice. Both deserve golden halos. Great wailing and gnashing of teeth this morning! How do we choose? Anna Alexander all the way! I commiserated with nurse Edith. What a trial to have a father whose long and dull sermons were what impressed him onto your memory. And I painfully get the criticism, “she’s always late.” But I voted for deacon Anna. I voted for her because she taught and raised up new teachers, nurses, and community organizers. She insisted that reading and writing would matter to students in the future even if they didn’t value those skills now. She persisted. Most difficult choice thus far! I had to go with Deaconess Anna as she so epitomizes the ministry of Deacon and has not been celebrated as has Edith Cavell has deservedly been! We so need Deaconess Annas in every struggling community! Anna appears to be one who quietly went about dramatically changing the lives of those she came in contact with for the better. I am convinced that these many, many often unknown saints bring the kingdom of God closer to us than some of the more famous ones, and exhibit in their own persons what God wants us to be. Although Anna was not executed, she too gave her life for her beliefs. She lived for her call. Though I’m from Georgia, and a teacher, I’m going with Edith. I am so impressed by her healing indiscriminately. The Good Samaritan has nothing on her, and she followed Christ’s example far beyond anything I would have done. She even surpassed John 15:13; she laid down her life for her enemies. Wow! This is something I strive to do in my life too – with God’s help. While “nevertheless, she persisted” is a nice rallying cry today – Anna gets my vote! I enjoyed reading about both of these women. Normally I would be an easy pick as my twin sister is named “Edith” and I am a nurse! I would have followed my heart voting almost by name and calling alone… Then I read more about Anna. An old, competitive, twin thing has emerged to guide my choice between these two interesting and devoted women. Anna, it is! As a nurse I leaned to Edith, but in honor of Archdeacon Jan Grinnell and Deacons, Jean Barry and Gail Wheelock, all of my parish. Jean started many programs and two shelters for the homeless and Jan has revitalized campus ministry at the University of Rhode Island and prepares many deacon postulates. While both are worthy choices, Anna’s legacy of education helped many across Georgia, and she deserves the notoriety a Golden Halo would bring for her efforts. I voted for Anna. We need to know and celebrate those who cared for and educated African American children when public education too often ignored them. I was struck this morning by the similarities of these two women when I reread their original bios. Both believed that anger, whether by hatred or bitterness, was a wasted emotion; that the only way to change her community, and ultimately the world, was through love for our fellow humans and the commandment of Christ to love and forgive, without regard to nationality, ethnicity, or our own bitterness. Could I vote for both of them? Deaconess Alexander persisted and raised up generations of educated African-Americans…even without the help of her diocese. She walked and rowed her boat several miles to touch and change lives. She was a determined spirit. Proud of our diocesan Saint who didn’t wait around for somebody to get behind her efforts. I will vote for Anna today…softness overcomes hard. Perhaps I will use this thought in one of my (lay preaching) sermons…hope Edith would approve, and invite folks for the weekend! I, too, have converted a bar to an altar. And I strive to be a pebble in a pond. So Anna it is. Tough choice, today, but I went with Edith. Let us all be “pebbles” from which ripples spread across generations! Edith has gotten enough recognition; go Anna! Today’s was the first time I wavered in my choice ..These are both courageous and wise women…but I finally chose Anna…. “Edith had plenty of capacity for her work, when she chose to exert herself.” I had at least one similar review as a student. I also love the quote on the memorial. My vote goes to Edith. Anna had me at ‘converted a bar into an altar’. 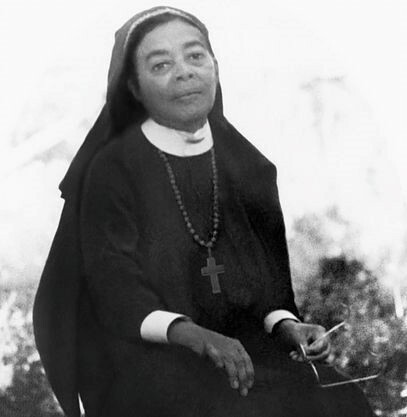 I think she truly was a pebble in the pond of Civil Rights, without any goal but to improve the live of the Children of God who looked like her. I was torn, but martyrs do it for me. As a retired nurse this WAS a really hard choice but, in the end I had to go with Anna because she overcame so much prejudice in helping educated people of color in a time it meant risking her safety. Again I say, a really hard choice today as both deserve a halo! Anna’s work continues to bless. This was a hard choice, and I believe both women are deserving of advancement. But in the end, I voted for the daughter of slaves who rose to near total obscurity, despite her service and ministry, rather than the daughter of privilege who is already admired and celebrated for her good works. Anna Alexander is the best vote for her peoples. May we all do small things, greatly. Ann today, after much thought. Two fine saints, two fine blogs, equals two too-hard choices. But as much as I like and relate to Edith, today I went with soft Anna, who truly raised the bar for worship spaces. Our college parish had a ’70’s slogan that went something like “Live music, no cover!” Cheers, ladies! This was a difficult choice, and I agree with the person who wanted both to advance. I voted for Edith because she continued to help all those wounded regardless of nationality even though she knew that this could be viewed as treason, and, in fact, she gave her life as a result of her commitment to this service. Impossible choice. The saving grace is they are already saints. My late husband was a teacher and it has been said of him that his work with his students was like dropping a pebble in a pond–his impact was so great and the ripples spread so far. So, of course, I voted for Anna, although Edith is certainly deserving too. How can I possibly choose? This feels like the “Sophie’s Choice” of Lent Madness. I love Anna’s ‘Bar of Christ,’ and she educated/caused to be educated so many young people. Imagine the ripple in the pond she created with all the “…teachers, nurses and advocates…” she influenced! As someone who deeply values education, I thought this would be an easy choice. Then along came Edith, rising above her supposed mediocrity and eschewing the social norms of the time by pursuing a career in nursing…during war time, no less! What really got to me, though, was her belief: “Patriotism is not enough. I must have no hatred or bitterness towards anyone.” She died for this belief! Oh, Supreme Executive Committee, why do you torture us with such impossible choices??? How can I even vote? Truly, a conundrum. I’m surprised the vote isn’t much closer. “The beautiful holiness of mediocrity”? We mediocrities may strive to be holy, and some of us may succeed, but mediocrity itself is not a holy condition. Neither, for that matter, is excellence. Edith’s story of finding her calling and following it into the jaws of death is deeply moving and inspirational; but my vote must go to Deaconess Anna, who persisted in her calling, against great odds, for at least sixty years. That number, and much other information, comes from a piece about Anna posted on the Internet by the Diocese of Georgia. You can find it by searching on her name and dropping down past the first few entries, which notwithstanding your search terms will concern the actress Ana Alexander. I found both women to be remarkable. It was a difficult choice. I, too, am surprised the vote was not closer. I had heard of Edith before but not Anna. Since people already know something about her, I voted for Anna. May all the strong women have their stories told so that they can take their rightful places in history. I’m enjoying reading all the good comments. Tough choice. There aught to be a way to split your vote. But had to go with Edith because I’m a sucker for the stubborn Martyrs of the world. Like Bonhoeffer she stepped up for what was Right. My wonderful church near the US Capitol, St Mark’s Episcopal (http://www.stmarks.net), has had a pub for decades. It serves beer and wine after the 11:15 service and social events. Maybe it has something to do with being near the U.S. Capitol. The parishioners need a drink after seeing what happens there. And there’s a pork and sausage shop at the other portal. In the end, I closed my eyes and picked. Otherwise, I could not have chosen. What a heart wrenching choice ! As many others I voted for both in the first round. Grabbing at straws to make a choice I added up that I’m a nurse, my parents severely restricted activities on Sunday, and hope that I would be strong enough to die for my love of Jesus……….my vote goes to Edith. Edith prevailed against all those who did not want her to do the work of God–to become a nurse, to care out of love to all people. Her selflessness was not sanctioned. As a nurse, I applaud her and hold her up as an inspiration and model. This match-up puts the “madness” in Lent Madness. I haven’t voted yet but am leaning toward Edith in honor of nurses everywhere. As a retired nurse I know how stressful the job is. Add the political climate of WWI Europe and…. Edith for me. No problem at all choosing this morning. The Deacon(ess)-I still have trouble with that “-ess” as I am a Deacon! The issue today is choice and I voted for Anna who ministered in a Church that was S-L-O-W to welcome those of us “sable-hued” Episcopalians. That was not a problem with nor to her because she ministered in the name of Jesus Christ to those who knew and didn’t know Him as their personal savior. She was a true emissary of Christ as she equipped all those who would be lifted up even when they didn’t know they needed or wanted to so be….and in Georgia, of all places ! OK ! Just joshing ! Mea Culpa ! I am sorry to have to choose between these two, but Edith both set aside national loyalties to treat enemy soldiers and gave her life for others’ freedom without fearing death. I hope that in such a situation I could make the choices she did. No contest. As a deacon, I feel I ought to vote for Anna. After reading about her life and watching the videos, I am compelled to vote for her. There was nothing occasional or reticient about Anna. Even though she wasn’t a martyr, she dedicated her life to serving others in all the ways that Jesus instructed us. I like the Celtic concept of the “green martyr,” the one who lives life daily striving to usher in the kingdom. “Martyr” is Greek for “witness”; there are many ways to witness. The early church identified martyrs as those who died for the faith. But perhaps our faithfulness is a type of martyrdom of self in favor of a higher selfhood. I’m going to hang onto that thought. I really like that thought St. Celia. I’m afraid I’m going with the crowd because of Anna’s inspiring work in educating black children (and I will not apologize for using the term “black”; it’s a lot better than what they were probably called at the time). However, I’d like to know who the composers were for the masses and opera in memory of Cavell. I was also attracted by the idea of turning a bar into an altar. Divine intoxication. Darned autocorrect….use the internet with caution! Yes, couldn’t find that. But I really loved the Cecilia McDowell piece! Lovely! Two fearless women. Both very inspiring. I went with Anna for being American, doing her good work despite push-back from those in charge, and touching so many children! How very interesting that both saintly women were the epitome of God’s peace and justice. Both worked in her own way to heal and empower ‘all of God’s children’. Both recognized the importance of each and every one of God’s children and worked to help each student/patient become the person that God created them to be. Both women are so worthy that choosing was hard…I cast my vote for Anna but will delight in either saint advancing to the next level. Rock on, ladies!!! I had to read through the comments first, but finally decided who to vote for. Edith the nurse already has a martyr’s crown from 1915 courtesy of the Germans, so I’m voting for Anna the deaconess who had way less privilege and in her day did not receive the support of her diocese the way she should have because of the color of her skin and her gender. And altering a bar into an altar is pretty cool. Wine & bread took the place of whiskey & bourbon. While I admire Anna and all her good works, Edith really speaks to me. “The beautiful holiness of mediocrity.” I’m sure Anna will win today’s matchup and that’s super, but Edith was approachable, a regular person like me. Anna got my vote, but I liked that Edith maybe did “not live up to her potential” Seems like teachers said that about me. A tough choice, but I chose Anna Alexander because I think we do not recognize enough of the holy men and women of African descent, with the exception of Martin Luther King and Bishop Tutu (who is not yet eligible!). And now that I think of it, we especially do not recognize the contributions of African-American women enough, especially those who came after Abolition. I agree! This is why I finally went w/ Anna. Tough choice and I do hope we see Edith Cavell again in LM. Anna all the way. We had a mostly African-American mission that was partially funded by canon law of the diocese. The diocese de-funded. It was a struggle, but with grants and support from other churches it continued to feed three meals a day, do job training, keep the day school going, before school and after school programs, drive kids to school, fight for them, get them boots when it snowed, etc. Now they struggle, but have raised enough to pay half the salary for a part-time priest. Having lived in the south and worked for and with a number of African-American churches, I know the struggle. I can’t imagine the strength of Anna. She stayed focused on her community and the art of education and Christian formation. She was so wise to preserve her energy and not get distracted by the injustices. It’s amazing that she so impressed her bishop that he named her a deaconess. (No small miracle there). Oh. Ironically, the defunding bishop preached at Anna’s church. He’s a spectacular preacher. Don’t miss an opportunity to hear him in person–even if it’s a days drive, or more. He’s at his best in a pulpit and when he comes down right into the congregation. Tis a joyful experience. Treat yourself–he’s that good. Last thought. I remember all the innocent children and mothers that were lined up and shot or sent to the gas chambers, and the Nightingales of WWII who landed at Normandy–especially Dot Lewis. They also treated all the wounded. This was the hardest! I finally went with Edith. It’s hard to live and treat your enemy equally. Edith has my vote. The courage it must have taken to persist in spite of man’s evil is astounding to me. I agree with everyone; this is a tough choice. In the end I think I will go for Anna because she did all that work and went unrecognized. Anna serves as an example for all of us, striving every day to help others and to spread the Christian faith. Thank you Anna for reminding us that we all are called to share our gifts. “Soft comes hard.” I need to remember this. I wanted both of these women to win. Both did God’s work through their own life choices. Edith was killed on my birthday, Oct 12, so that gave her a little edge, but I live in Georgia and I know how important it is to instill love of learning to children who don’t always have opportunity, so I went with Anna. I’m not sure if “Edith, quite contrary to her desire only to be remembered as a nurse who did her duty, was recast as a national martyr” is quite accurate. Recently discovered information has revealed that she was in fact sending secret intelligence to the British and thus essentially acting as a spy. The MI5 wanted to suppress this information and also use Cavell’s death as a useful propaganda tool. I suppose how this plays into one’s view of her saintliness depends on one’s views of WWI. A difficult choice, but I had to go with Anna. Have lived in both Georgia and Belgium, so I couldn’t use “Where have I lived? ” to make a connection. Why do you have to make it so difficult? It was so hard to pick today. I thought about closing my eyes and hitting the screen. Both were remarkable women. I am blessed to have learned about their lives and wonderful works. In the end, I think I will vote for Edith. We owe so much to african-Americans for our history of slavery and bigotry. Anna worked tirelessly in the face of adversity. She has my vote. Anna got my vote but “the beautiful holiness of mediocrity”, in reference to Cavell, is the phrase that stuck with me. I’m going to go hunt for some holiness in my mediocrity. I am a nurse, could I vote for anyone other than Edith? Anna comes close but Edith won my vote! Tough choice today. A very difficult choice – both such amazing women who greatly enriched the lives around them. What tipped my hand was a simple and frivolous thing… that my mother chose to climb many times into the crawl space under their home to retrieve the cards that my grandfather had tossed through the unfinished floor to keep her from utilizing the devil’s playthings! Nevertheless, Edith, and my mother, persisted in their passion for cards! This is a really tough matchup, and either one is worthy of the Golden Halo in my book! But as a practicing RN for almost 40 years, who also didn’t get glowing reviews as a student at times, today I must go with Edith. Yes this is a very difficult choice. I too am one of those who just kind of skates through life with only mediocre effort. I really could do much better if I applied myself. I am however, very punctual. But when I read Anna’s story, I immediately thought of one of my favorite fellowship activities “Beer and Hymns”. Anna gets my vote. Since I admire both, I followed my habit in such situations by checking vote totals and voting for the one with the lower total. Either would be a good example for us, but I want the vote to be close. In today’s political climate, Edith’s quote, “Patriotism is not enough. I must have no hatred or bitterness toward anyone”, was the tipping point for me. She got my vote! Tough choices today! I agree, Golden Halo for both women would be most appropriate. As a nurse and a nursing instructor, I had a hard time to decide between the nurse and the teacher. In the end I went with Edith, but am blessed by now knowing about Anna as well. I will strive to follow in both their footsteps. Tough choice today. I’m still pondering my vote. Anna Alexander was virtually unknown to me before this edition of Lent Madness, while as the result of many visits to the UK I knew the story of Edith Cavell fairly well. It took me a while to agree with the “recasting” of her as a “national martyr” in the ’20s partly because it sounds as though Edith was being co-opted into a form of civil religion rather than being recognized as a saint in Christian terms. I view her differently today. However, my dawning recognition of the role of African-American in all aspects of American life–the nearly invisible brought into our vision by a certain softening of our hearts–makes the example of Anna one I can strive to follow wholeheartedly, so she received my vote. Edith’s unwillingness to be bitter is even more admirable when you know the full extent of what happened to her, which hasn’t been mentioned. Britain thought they would go in and win WWI rapidly and be home by Christmas. By the time Edith was tried, the Brits were weary of the war, the Americans weren’t involved yet, and the end was nowhere in sight. The Americans and the Spaniards made desperate efforts to save her life; the Brits did not. I am English, BTW. From what I’ve read, it seems Edith was a pawn, at least to an extent, in rallying public opinion in support of the war – a young woman martyred for God and Country. Had she been spared, the support of the war might not have sustained the effort until the Americans joined in. A terrible thought, but Edith may well have saved many, many more lives than anyone will ever know. I’ve read that, too. But I can’t agree with you that Edith’s death being used to gain more support for the war saved lives. If the war had ended in 1915 or 1916, far fewer people would have died. Edith’s quote is striking a cord with me today. In my mind, respect for humanity should outrank everything. It doesn’t matter the source of a disrespect, my personal responsibility is respect. As a teacher and as a Georgian, I had to vote for Anna. I loved both choices in the earlier round, but Anna is the one I find myself gravitating to here. Her work built more than just educated people, it built a legacy of caring which is long lasting. I decided on anna. What a difficult choice. Both are saints in my book. I’d like to vote for both! Not possible and a no vote doesn’t count. I chose Edith because she had a relatable child life. Well, that is good thinking, Elizabeth! Both these biographies were so beautifully written! Really made both of these remarkable women come alive for me. Wish I could vote for both. The apparently somewhat controversial quote about Edith having “plenty of capacity for her work, when she chose to exert herself,” actually helped me to identify with her. I do admire Edith, but Anna is the clear choice here, and she got my vote. We sometimes forget that Christianity was built on the blood of martyrs because it happened in such a remote past. Edith has my vote. Anna gets my vote, partly because of her father’s maxim, “Soft overcomes hard.” That is a difficult maxim to live by, but I have seen it prevailing in so many situations.